Someone asked for something like this awhile back & finally got around to doing it.. I hope there still around. 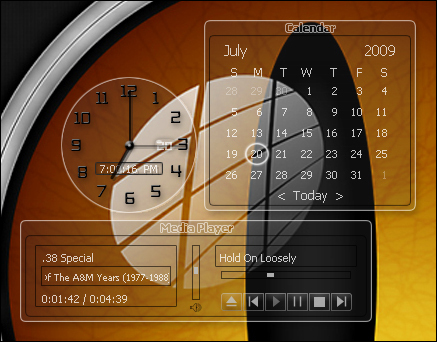 Anyway see through clock with media player & calendar. Click on 3 & 9 to toggle media player or calendar. They asked for an mp3 player but I think this one plays them too...Thanks to Martin for script.. Seem to have a problem with this widget. For some reason its not giving any time. And the clock on my PC is correct. Any idea what would cause this? If you want to give me an email address to send some sdplugins to, you can try putting them in desktopx sdplugin folder & see if that helps.Some people don't have certain plugins so time won't show without it.. Let me know..Or if you just want to email me at relhom@cox.net that will be fine..